Everywhere I look, Regency goodness springs forth. Here is some of the most interesting Regency content I found today. 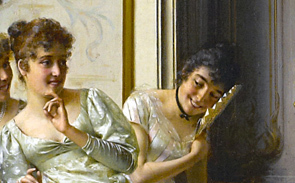 Click the headline and you will be taken to our custom feed of delightful articles, the best from around the Regency World. This month, I am writing about the first book I ever read by Jo Beverley, a book that got me hooked on Jo as an author. Though the widowed Chloe Stanforth loves her house by the sea, a series of puzzling incidents has left her unsettled and anxious to find a new home. Her situation is complicated by the arrival of her husband’s cousin, for whom she has long harbored a deep and guilty attraction. Back from the war, Justin Delamere hopes he can finally woo Chloe, until he suspects her guilty of treason-and murder. Can he trust the woman he’s always desired, and can Chloe surrender her most private secrets to the man who controls her freedom and now her heart? 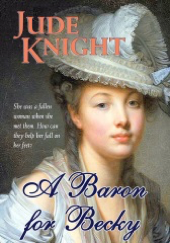 As a long-time mystery lover, the notion of a Regency mystery thrilled me, and this book did not disappoint. I loved all the odd clues and details the author used, so Regency and so country-house mystery. She captures both genres well in this lovely little book. A couple of months after I read this book, I met Jo Beverley. She had long since moved on from writing traditional Regencies. Indeed, Walker Publishing had stopped publishing Regencies by this time. I told Jo how much I enjoyed the book. After thanking me in her gracious way, she then told me she would never write such a book again. She said having to worry about everyone in the house was too much trouble. “You have to think about all the servants.” Spoken in her lovely Lancastrian accent, “servants” came out almost three syllables with the barest hint of an r on the first emphasized syllable. The author charmed me nearly as much as that first book and most of her books since. 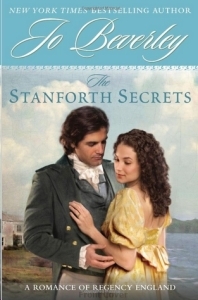 Although The Stanforth Secrets was published in 1989, it is now available on Amazon. Highly recommended to those who want a clean, traditional Regency romance along with a fun mystery. It just gets better. Here is some of the most interesting Regency content I found today. Click the headline and you will be taken to our custom feed of delightful articles, the best from around the Regency World. The Bible recounts tales of resurrections of the dead (Thank you Jesus). It also tells of ghosts, not just the Holy Ghost (Again thank you God). 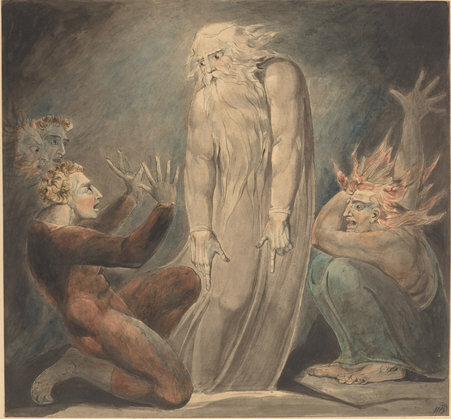 In this haunting painting, William Blake (1757-1827) captures the ghost of Samuel the Prophet as he appears to King Saul, who has conjured Samuel up to get details of an impending battle against the Philistines. Instead, the spirit of Samuel tells him of Saul’s and his son’s deaths in that battle (1 Sam. 28). This drawing is from 1800. You can see it and others at the collection of downloadable images at the National Gallery of Art. Yeah, National Gallery of Art. See more British Paintings & Sketches here. 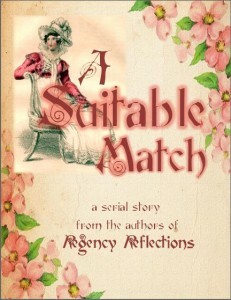 To kick off the second year of celebrating Inspirational Regency fiction, we presented a serial story, A Suitable Match. At the end of the month we’ll be giving away a fabulous prize package filled with items tied to the story. “Gone? She can’t be gone!” Chard glanced at Twiford who uttered the same words, the panic and disbelief in his voice mirroring Chard’s. “I’m sorry, my lord, but I checked her room myself. It’s empty.” The servant shuffled his feet, probably in anticipation of fleeing the company of two angry peers. Lord Twiford stomped from the room with Chard on his heels. If she had left, she couldn’t have gone far. Cressida pressed her ear to the doorjamb, careful not to scrape it against the rough wood. A little ache and discomfort was one thing. Some things had to be suffered through in order to achieve the desired result, after all. A mass of splinters in the side of her face was another thing entirely, and something to be avoided if at all possible. Her nose flattened as she pressed into the door, peering through the knothole. If she angled her head just right, she could see the counter at the bottom of the stairs where the innkeeper did business. Moments earlier the innkeeper had informed the servant that she had vacated her rooms, implying that she had departed from the inn entirely. The man had been hesitant to give her a new room late last night so she could fool the men into thinking she was gone, but an old silver locket had been enough to purchase the new room and his cooperation. She hated to part with any of her inherited jewels, but this trinket was by far the least valuable. Besides, it was worth it if it allowed her to escape the company of the men from her past. “What is the meaning of this nonsense?” Lord Twiford’s voice shot up the stairs followed by the reverberation of his pounding on the innkeeper’s counter. It was too bad that such a contrary disposition wore such a pleasing appearance. Lord Chard joined the party, adding his own demands that the innkeeper tell him how she had left the premises. Cressida’s heartbeat rushed a little louder through her abused ear. Recollections of stolen kisses and quiet talks flooded her mind. The years had not done enough to dampen the memories of her engagement. How could she possibly find another man to wed in London where frolicking dances and intimate rides in the park would forever make her think of him? It appeared his opinion of her had not improved over the years. Spoiled, careless, and vain were going to be his next insults if memory served correctly. “Cease, Twiford. She doesn’t deserve your disdain now any more than she did then.” Chard beat his hat against his leg, looking past the innkeeper into the common room beyond. Was he hoping she would be sitting amongst the locals enjoying a cup of tea? A smile crept across Cressida’s lips. Chard had defended her back then? She’d always wondered. Cressida’s smile fell into a frown. Breaking their engagement had not been a fit of selfish impulsiveness. How dare he discount her sacrifice on his behalf? She pressed a hand to her forehead and abandoned her knot hole to rest her head on the solidity of the wall, feeling dizzy despite her prone position stretched along the floor of her new room, just two doors down from her old one. Men! If they could just decide on whether or not they disliked her, they could go on to London and leave her to figure out her own transportation. The locket she’d given the innkeeper might be enough to rent her a post chaise to continue the journey. Cressida’s eyes flew open. She jammed her face against the door and felt a prick as a prong of wood stabbed her in the ear. Ross Ainsworth had recovered sufficiently from his head wound and decided to join the drama at the innkeeper’s desk. “Who are you?” Chard demanded. “How distant?” The menace in Twiford’s voice crawled up the stairs and wrapped around her throat. She could feel his displeasure, it was so thick. An odd warmth filled Cressida’s midsection. It took a moment to recognize it as pleased surprise that he would defend her honor. But which “he” had caused the pleasure? The three men leaned over the counter, addressing the nervous innkeeper. “How did she leave?” Chard asked. “Then she hasn’t left,” Ross declared. “She might have walked.” Chard rubbed the back of his neck, shifting his weight back and forth as if he wanted to do something, anything, other than stand around discussing the situation. “We could set out in different directions on horseback. It wouldn’t take long to catch up with her.” Ross grimaced, probably thinking of the agony putting his battered body on a galloping horse would cause. The men exchanged glances and then glared at the innkeeper. 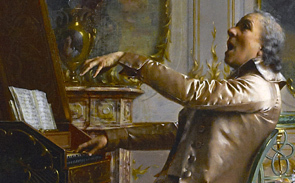 The man coughed and ran a finger between his neck and cravat. A young servant girl slipped around them, carrying a loaded tray of tea, toast, and Cressida’s favorite orange marmalade. “To the young lady upstairs, my lord. Her maid, Knighting, said to bring it up this morning, as her mistress would be indisposed and unable to come down.” The maid bit her lip as she looked from the three men to the innkeeper. Cressida’s heart stopped. Her breath turned to stone in her lungs. This couldn’t be happening. She’d been so close. “Where is this ‘indisposed’ young lady?” Chard asked. Lie! she screamed in her head, willing the servant girl to tell them she was staying in a room at the back, or that she’d been wrong and it was actually an old woman, or, better yet, a child. Anything to buy her just a little more time, though Cressida had no idea what she would do with those precious seconds. So much for that wish. The three men turned and looked up the stairs, right at her little knothole. Did you find the hidden item? Note it in the comments below for a chance to win. Don’t forget that the readers will ultimately choose who truly loves Cressida, and whom she loves in return. Already have a favorite? Go vote for him! Want everyone else to vote for him too? Grab a voting badge from the Suitable Match Extras page. What do you think the gentlemen are going to do next? Read the next installment! Wow, there is more. Here is some of the most interesting Regency content I found today. Click the headline and you will be taken to our custom feed of delightful articles, the best from around the Regency World. It’s like the 4th of July Fourth around here! Nope, It’s Columbus Day. Just taking some time to remember sacrifices and discovery on Columbus Day. As much as we love writing about early 19th century England and are fascinated by the society and history of that country, we are truly blessed to live where we do. Take some time today to pray for the men and women fighting to maintain freedom and for the families of those who made the ultimate sacrifice. I am lurking on the Regency web, and I am so impressed. Here is some of the most interesting Regency content I found today. Click the headline and you will be taken to our custom feed of delightful articles, the best from around the Regency World. Here they are. This is not showing well on mobile. Glad you can join me here, today. Well, the porch at the Regency Reflections Blog now possesses new paint, a bit of a makeover. We’ve been posting here since 2012. We love being able to showcase different glimpses of Inspirational Regencies, talking about the stories and the motivations behind them. We’ve even given tastes of the Regency romances that hooked us long before the first traditionally printed Christian Regency was released. But our fire had grown cold. It was time find our love again. 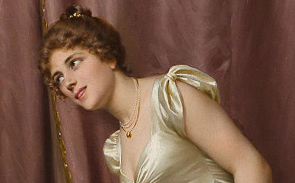 The reason I write Regencies is because I found my voice in the 1800’s. It sounds of a woman, with dreams of a happy-ever-after, challenged by the circumstances, the very skin she’s born within. These stories, gifted by my first love, a passionate, merciful God must be told. It is my first love. And this blog will now share stories of authors and characters who possess the same fire. Now some of my friend’s stories may be secular authors. Before you throw holy water at me, I just have to say it. Not everyone is meant to entertain the pews. All types of stories are needed to edify, entertain, and to educate. All of my friends, regardless of what they write use their God-given talents to bring joy and hope into this world. This is something all should see. My first guest is the wonderful Jude Knight. Jude traveled all the way from New Zealand to have tea with me on my Atlanta porch. Jude writes strong determined heroines, heroes who can appreciate a clever capable woman, villains you’ll love to loathe, and all with a leavening of humor. “My beloved and I have known one another for 47 years, and been married for nearly 44. In that time, our love has been tested over and over, but each challenge we’ve surmounted has made our relationship stronger. “The trick of a happy marriage (and a happy life) is to go on loving one another between trials, and to consistently fall in love with the same person, over and over and over. Because love is not about being in love, pleasant though that state is. Love is an action, not a state, not a feeling. Love is making breakfast for the person you want to brain with the frypan. Love is listening to the same joke for the twentieth time and laughing yet again. Love is walking hand in hand for no better reason than that you are fond of one another. Love involves feelings: lust and affection, familiarity and friendship, mutual respect and regard. It grows on shared experiences, memories—both good and bad—of the things you’ve lived through together. But above all, love is what you do when your feelings prompt you against being loving. Now that is a message to kick off the new Regency Reflections. Thank you Jude. While my friend takes a swig of her green tea, I just want to thank her for traveling to Atlanta and being my guest. Below is more about Jude and links for A Baron for Becky. 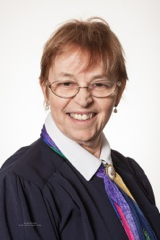 Jude Knight is the pen name of Judy Knighton. After a career in commercial writing, editing, and publishing, Jude is returning to her first love, fiction. Her novella, Candle’s Christmas Chair, was released in December 2014, and is in the top ten on several Amazon bestseller lists in the US and UK. Her first novel Farewell to Kindness, was released on 1 April, and is first in a series: The Golden Redepennings. Here is some of the most interesting Regency content I found today. 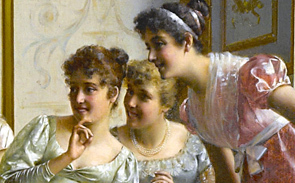 Click the headline and you will be taken to our custom feed of delightful articles, the best from around the Regency World.